David has recently established Aurora Prime Real Estate Limited to focus on a new dawn emerging in Belfast. He believes that the ingredients are in place for a transformation in Northern Ireland’s capital city returning it in a modern day context to what it was a century ago – a hive of industry, creativity and wealth formation. In conjunction with Crescent Capital, which has been investing in Northern Ireland since 1995 and is the largest independent fund manager in the region, Aurora is seeking to raise £50m locally and internationally to invest in Grade A office space in Belfast. Until April this year, he was Chief Executive of Titanic Quarter Limited – a strategic site that has the potential to become one of the most exciting developments across the islands of Ireland and Britain. 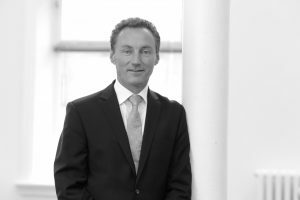 Previously he was the Executive Director of Quintain Estates and Development plc responsible for the specialist fund management business which focussed on residential healthcare, student accommodation, science parks and niche secondary property. Prior to that, David was Chief Executive of Strategic Investment Board Limited for six years, advising Ministers in Northern Ireland on the infrastructure programme across the region. He has extensive experience in project and tax based finance and was a Director of Hambros Bank in the City of London. David is currently Chair of Visit Belfast and Sports Changes Life. He is also Vice Chair of the Regional CBI (becoming Chair in 2016) and Vice Chair of the Washington Ireland Program. David has a degree in Economics and Social Studies from Trinity College Dublin having had his secondary education at Blackrock College, Co Dublin. David is married to Helen O’Malley and together they have 8 children (four boys, four girls) ranging in ages from 23 to 2 years old! He lives in Killinchy, Co Down and keeps fit by running, with the occasional half-marathon when he is not chasing kids!